You see the resemblance, of course. It was even more pronounced 20 years ago, when I still had all my hair (and a nifty potter's apron). The clincher? He's throwing left-handed. Pin-holing. A glaze defect leaving small pits, sometimes sharp-edged, in the glaze surface. In stiffer glazes, like my white base, this can be caused by small irregularities in the clay underneath, if the glaze doesn't flow to fill them. In other glazes, particularly those with a high titanium content (Woo's Blue, for instance), pinholes form when gas bubbles burst from the molten glaze but don't smooth over again. These guys can be very sharp-edged. I've been struggling for a while with the firing atmosphere in my glaze kiln. My glazes need to fire in a reducing atmosphere for best results: creamy color, iron speckles, best oxide and stain color reaction. The problem was getting the atmosphere consistent. There was always an oxidizing spot, usually low and toward the front left, near the door jamb. I assumed an air leak through the door, around the frame, or even through gaps in the floor, but no amount of tightening brick or packing/wadding with ceramic fiber made any difference. Then one day a couple of months back, while unblocking the burner ports prior to unloading a particularly unsuccessful firing, it occurred to me that the gas pipe along the wall supporting the burners was not actually parallel to the wall of the kiln. The tip of the front burner was actually a good two inches further from the burner port than the back one. Light bulb time! As I've explained before, you get a reducing atmosphere in the kiln by controlling the ratio of air to fuel in the kiln. Too much air, oxidizing; too little air, reducing. But there's two different sources of air in the kiln, and two ways to control it. Primary air is pulled through the burners themselves, by the low pressure caused by fast-moving gas coming out of the aperture into the mixer. (This is the venturi effect, so we call them venturi burners.) 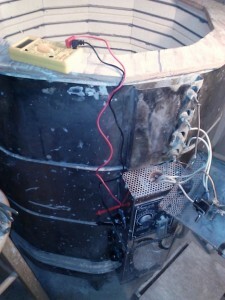 A disk threaded onto the back of the burner limits the amount of air drawn into the kiln. Twisting the shutter open allows more air, closed, less. Secondary air comes in through the burner ports, mostly, but also through the peep holes, cracks in the door, gaps in the floor, what have you. The draft from hot gases exiting up the chimney pulls secondary air into the kiln, where it combines with unburned fuel from the burners. The amount of secondary air is controlled by the damper, a kiln shelf that slides in and out of a slot in the chimney. Close the damper, the kiln reduces. Open it up and the atmosphere becomes neutral or even oxidizing, as the excess fuel is burned more thoroughly. The problem is, while it's possible to control primary air at the individual burners, secondary air has only one control for the whole kiln. Normally, this isn't a problem, as the gaps and openings are evenly distributed around the kiln, but here I had a burner with a lot more space around it for secondary air. And it happened to be in the corner of the kiln where oxidation was a persistent problem. But how to fix it? The gas pipe is old, joints solid with rust at this point, so moving one end closer to the kiln would be a major project. I tried just wedging a piece of 2-by-4 between the burner and wall to push it closer, but it didn't move appreciably. I could try to compensate by cutting back the primary air, or even by running extra gas through that burner, but how much is difficult to estimate. So the only thing left is to move the kiln wall closer. No, not really. What I did is take some thin sections of soft brick, each about an inch thick, and build a collar around the burner port, closing the gap between burner tip and brick. My first firing after the changes was astonishing. The lower corner was reduced perfectly. There were a few random oxidation spots, both about chest high. One was in the middle of the back wall, the other at the left door jamb, but they were very small, affecting about half a pot each. 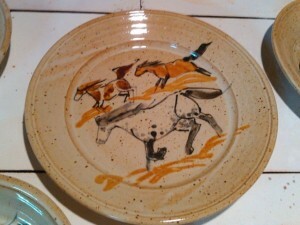 The second firing, which I unloaded last night, was perfect. No oxidation anywhere in the kiln, and no over-reduction (which causes excessively brown pots, and sometimes bubbling in the black and green stains). And the cones? Even, top and bottom, to within millimeters. I've shown the fix to Jon and Beth, two of the other potters who fire this kiln, and explained my repair. I'm not sure how long it will be before I load high-value items (teapots, special orders) into what used to be the death zone. Maybe one more firing? I need to convince myself that this thing is in fact repeatable. Saggar. An enclosed vessel used in firing to contain a specialized atmosphere and the pots within it. A saggar can be as small as a covered jar or large as a brick box, chinked with clay and topped with kiln shelves. Saggars were originally used in Chinese pottery to protect delicate celadon glazes from the ravages of wood ash. 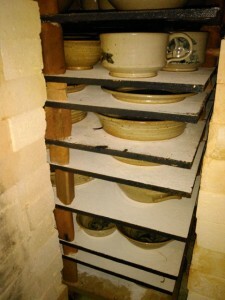 Entire chambers of the kiln would be stacked with ceramic boxes, each forming the lid of the one beneath it. Common peasant ware would be stacked around them, unprotected from the ash deposits and drips we so cherish now days. In Europe, where they used sulfurous coal as a kiln fuel, saggar firing developed into the Muffle kiln where the entire stacking chamber was sealed off, isolated from the corrosive flame. In modern times, with clean gas or electric firing kilns, we've reversed the purpose. Saggars contain dirty firing atmospheres within our clean kilns. Pots are nested in sawdust or charcoal, draped with seaweed or salt-soaked straw. Bits of copper wire or steel wool are strewn on top. Marvelous, atmospheric effects can be achieved at low temperatures. In high-fire, saggars are often used to salt or soda fire in a kiln not normally devoted to that purpose. You have to be careful how much you use, though. A friend of mine in my Craft Center days tried a saggar full of salted peanut shells, and the resultant foamy mass of salt-and-ash glaze rose up and engulfed his poor little pot. Because the soda is in the kiln atmosphere, it also deposits on brick, shelves and posts, with the result that a kiln once used for soda is always and ever after a soda kiln. Soda is corrosive to soft brick, so hard brick is generally preferred for the hot face on soda kilns. Wadding. Left to its own devices, soda vapor would weld pots to the kiln shelf. To prevent this, ware is stilted on small wads of friable (crumbly), soda resistant material. The mix may include clay, alumina, fine grog, calcium carbonate, sawdust, flour or other material. 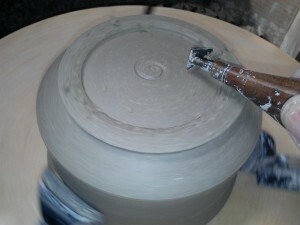 Wads are usually applied wet while loading the kiln, though some potters dry them and glue them onto the pot beforehand. After firing, they're crumbled away. As I think I mentioned, I ran into a bunch of former students of mine at the Corvallis Fall Festival. This isn't surprising, after all. I taught for 10 years at the UO Craft Center, three or four classes a term, up to ten students per class or workshop. That adds up to enough subjects to form their own statistical universe, though the sample bias is probably extreme. I frequently get asked whether I'll be teaching again. The long answer involves best use of my time, available workspace, energy levels, relative remuneration; the short answer? Probably not. One of the folks from Corvallis asked about the Ceramic Whistles class I used to teach. We made ocarinas--eight note whistles--in a couple of styles, in either one or two three-hour session. I haven't made a whistle in years, but did remember where I'd filed the class handouts, so I was able to scan them and clean them up. Emailed them to Tina, and also to Renae, another Craft Center resident potter who's now teaching in Portland, and gets asked about ocarinas (ocarinae?) regularly. And I thought I'd share them here as well. 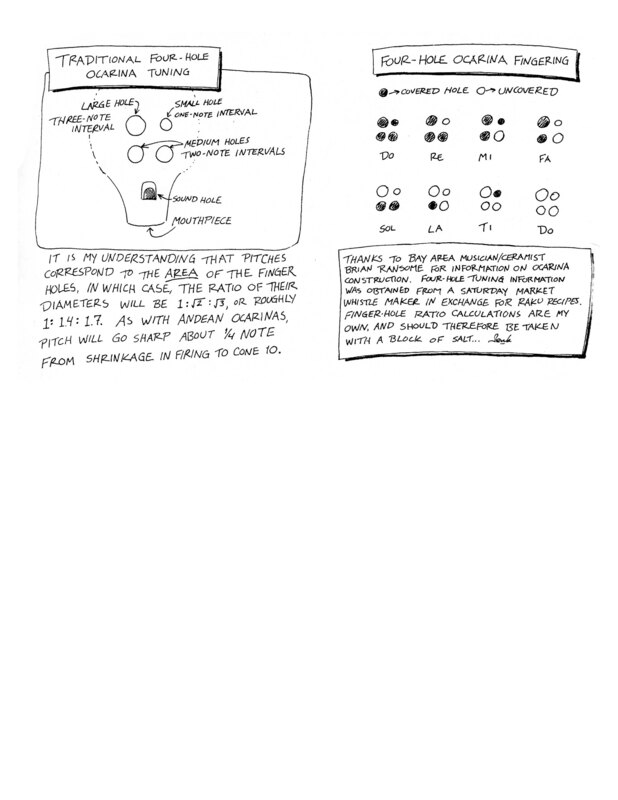 Picture one is for Andean-style ocarinas; two and three for European. Click to embiggen. 1227. Designates an electric kiln with twelve sides, 27 inches high. Technically it's a model number for a Skutt brand kiln, but potters use it (and the smaller 1027) interchangeably on different brands. My bisque kiln at home is manufactured by Cress, but it's a 1227 regardless of its actual model number. Kiln rings. For ease of shipping, repair or expansion, most ten and twelve-sided kilns are made of modules, each two bricks high, nine inches, with two elements in each, sharing a control box and switch. You can expand your kiln by removing the lid and stacking on another ring if you need more space, say for large sculptures. Blank ring. A kiln ring with no elements or switch, usually only one brick high. Used to expand a kiln temporarily to fire something a little too big for the standard size. We've got a 2.25" blank ring at Club Mud for the smaller, 1027 electric kilns. Element channel. 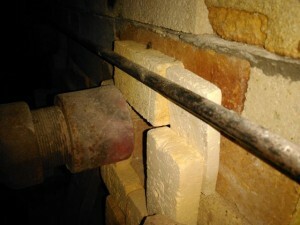 Groove cut into the soft brick to hold a kiln element. Elements. Long coils of high temperature alloy wire that glow at high voltages--think giant toaster. They're custom wound to fit a particular kiln, with crimps built in at each corner, and a doubled lead at each end that runs through the wall out into the control box. Because they have to provide more heat to compensate for loss through lid or floor, the top and bottom elements are wound with more coils than the center four elements on our kiln. Element pins. Lengths of high-temperature wire used to hold elements down in their channel. Standard ones are straight, but you can also buy hook-end or staples, which are handy when working around damaged bricks. Oxide coat. A protective coat of metallic oxide that forms over elements during firing. Repeated firings, particularly with a reducing atmosphere, say carbonates from clay, or smoke from burning out paper in a sculpture, will damage the coat. It will reform again, but leave less element underneath. Eventually the diameter of the element will be enough smaller to affect the resistance and the firing time and efficiency. Resistance. To electric current. Too little and the elements won't generate heat. Too much and either the current can't get through (again, no heat) or the element overheats and melts. Crimp or barrel connector. A metal tube that slides over the end of the element wire and the power lead and is crimped (compressed with a pliers-like tool) in place to make an electrical connection. Time for some definitions again? Hot face. The inside surface of the kiln wall or door. (Cold face is obviously the outside.) Because brick expands and contracts with heating and cooling, these will tend move away from each other unless tied together by brick set to connect the two. Kiln brick comes in several varieties, also shapes. For this job, we only used standard straight brick, 4.5 x 9 x 2.5". Hard brick. A dense, high alumina heat-resistant brick. Very good in high-stress environments, like the flame channel (in front of the burners), bag wall or chimney flue. Not generally used for an entire kiln, because it absorbs too much heat, so uses more fuel to fire. Exceptions are wood or salt kilns, wh6ere the kiln atmosphere is corrosive to soft brick. Soft brick. Also known as insulating firebrick. Heat resistant brick that's been formulated to be porous by mixing in sawdust or diatomaceous earth. Because it's riddled with air pockets, it absorbs less heat, so a soft brick kiln is more fuel efficient. Soft brick is rated by temperature: K23 is recommended to fire to 2300° F., K26… you get the idea. Technically, cone 10 is a little over K23, but not by much, so we still use them in stoneware kilns. Kaowool. Ceramic fiber insulation, an offshoot of the space program. It's what's underneath the tiles on the space shuttle, a thick, white layer like slightly crunchy cotton. Incredibly fuel efficient, but nasty to work with, as the fibers become fragile with too much heat, get airborne, and are very bad to breathe. There are ways to make a kiln of this stuff, but at Club Mud, we reserve it for extra insulation on the cold face, over the arch, for example, or to pack into gaps. Sairset. A brand of high-temperature kiln cement. We've used it to repair broken bricks in the electric kilns, and to attach brick to the steel top lintel of the stoneware kiln door. Bag wall. A structure to redirect flame. Ours deflects flame from the burners upward to curve under the arch, through the pots and out through a channel in the floor of the kiln. Without a bag wall, the flame would hit directly only on the bottom pots, and the top of the kiln would be consistently cold. Greenware. Green as in fresh, new, not as in color. 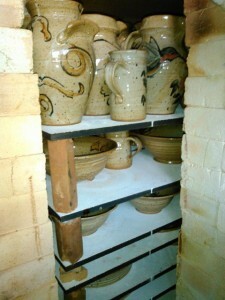 This is just unfired pottery, generally used when the work is dry, e.g. "I just loaded a batch of greenware into the kiln." Oddly enough, the painted ceramics world uses it to describe bisqued ware. I had to explain this one a zillion times, back when I was teaching. #1 Pottery Plaster. The best quality, most uniform plaster for making molds. Better than Molding Plaster and much better than Plaster of Paris. Cottle. The walls of a mold into which you'll pour plaster. For a small mold, you can use a thick slab of clay, well stuck to the base board. Larger forms will be contained by boards, clamped together at the corners, well-sealed with clay or plasticene coils at the base and seams, and liberally coated with a mold release. Mold release. A substance that keeps plaster from sticking to the piece being molded, the bottom of the mold or the cottles. Typically Murphy's Oil Soap, or an aerosol mold spray. For quick-and-dirty projects, WD-40 or kitchen pan spray will work. If you're making a single mold from a wet-clay original with clay slab cottles, don't bother with any of this stuff. Just peel the clay out when the plaster is set. Slip mold, press mold. Different ways of using plaster molds. A slip mold is poured full of specially formulated, deflocculated (don't ask. I'll explain some other day) liquid clay slip. 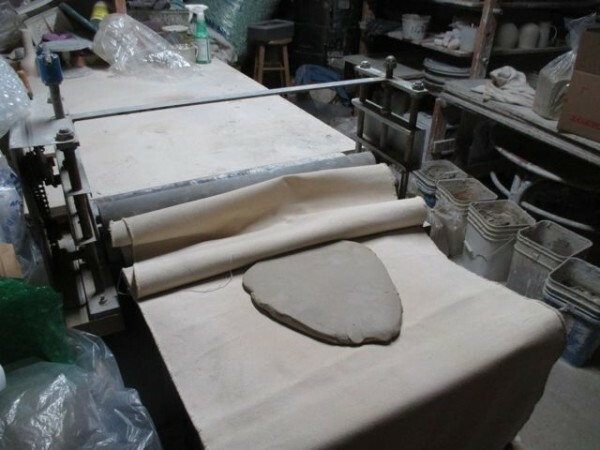 After a set period of time, during which the plaster absorbs water through the inner surface of the mold, the excess is poured out and the remaining shell of clay is allowed to harden before it's removed from the mold. Press molds require less chemistry. Plastic clay is pressed into the mold with fingers, a sand-bag, sometimes a rubber mallet. Excess clay is trimmed away, and the piece is allowed to set until the surface has been dried by the plaster until it is no longer sticky, then removed. Sprig. A low-relief decorative element on a pot. Usually made with a small press mold. The mold is pressed full, extra clay is removed with a wire, and the mold is positioned over a scored/slipped spot on the pot. Moderate pressure attaches the sprig, at which point the mold is removed and filled for the next sprig. Elements. Coils of nichrome or kanthal (high temperature metal alloys) wire that glow red hot when you run high voltage current through them. Think of the glowing wires inside your toaster, if your toaster was big enough to climb into. Not that I recommend that. Three-heat switch. A rotary switch for high voltage with three settings--low, medium and high. In addition to kilns, some vintage electric stoves used to use them, though now they all use continuous switches. Pity. If there were more demand, there might be more manufacturers and the price wouldn't be so high. Kiln sitter. A Rube Goldberg affair--excuse me, an electromechanical device--that switches off a kiln when a certain combination of time and temperature is reached. A pyrometric cone is supported on two metal prongs inside the kiln, with a third prong resting on top. The third prong is on a pivot, with a hook on the other end holding onto a weight that's hinged over the "on" button. When the kiln gets hot enough, the cone begins to melt. As the cone deforms, the inner end of the prong goes down, the outer, hooked end goes up, the weight drops, the button pops out, the little cage slides down the pole and traps the mouse--wait, where was I?--and the kiln turns off. Because this is self-evidently an infallible device, the manufacturers eventually added a limit timer to shut the kiln off in case the sitter failed to do so. Thermal expansion. 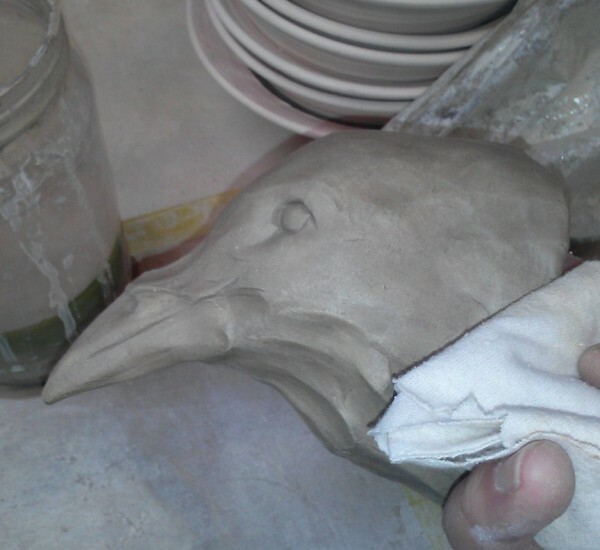 Clay and glazes both expand when heated, contract when cooled. 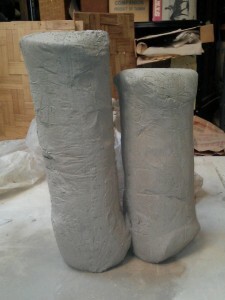 While the glaze is molten in the kiln, any difference in expansion between the two doesn't matter. On cooling, though, the glaze solidifies into glass, and any difference in shrinkage between glaze and clay body can be a major issue. Crazing. 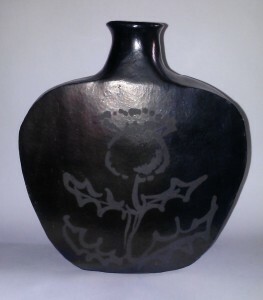 If a glaze shrinks more than the clay body it's applied to, a network of fine cracks can appear. This is called crazing. In stonewares, it's not a huge problem, but porous clay like earthenware will leak liquids if the glaze is crazed, and I've seen it happen on porcelain occasionally. Sometimes used decoratively, when it's called a crackle glaze. Shivering. When the clay shrinks more than the glaze coat, bits push away from the pot, especially where there's extra pressure--rims and edges, mostly. Crawling. When melted glaze beads up, leaving patches of bare clay. Has a variety of causes--dusty pots, high surface tension, too much raw clay. Calcine. To expose to high heat, generally bisque temperatures. Calcining zinc oxide drives off moisture. Calcining is also used to turn gypsum into plaster and limestone into cement. Calcining clay drives off moisture and organic impurities and changes the structure so the clay will no longer expand or contract on exposure to water. Kaolin. China clay. A white, primary clay used in porcelain. Ball clay. A secondary clay--one that's moved by water from the feldspar deposit where it originated. This means it has finer particles, more plasticity, also a little more organic impurities. Usually still fires white. Shrinks more in drying. Pug mill. A clay mixer. An auger in the tube mixes the clay thoroughly and forces it through a screen that catches foreign objects and cuts into air pockets. A vacuum pump de-airs the clay and the auger compresses and extrudes it again. I use mine to recycle scrap clay; some people run all their new clay through as well, rather than wedging by hand. Pug. Clay extrusion from a pug mill. Duh. Drying bat. Tub for drying out wet clay scrap for recycling. The simplest of these are made from cast plaster, but I don't like plaster in the studio, as scraps in the clay will cause bits to pop out after firing. My drying bat is a rectangular frame made from 2x6" pine, with a bottom made a layer of plastic window screen supported by 1/4" hardware cloth supported in turn by 1x2" strips. The whole thing is mounted on heavy duty casters to roll in and out from under my ware racks. I line it with an old bed sheet, fill it with wet scrap and fold the sheet over the top. In a couple of weeks, it's dried to a firmish mass that I can cut into blocks and run through the pug mill. Wedging. A process of cutting up clay and slamming it on the table top, followed by kneading. This mixes wet and dry clay thoroughly, removes air pockets, and aligns the clay particles to make a denser, stronger body. I used to recycle all my scrap clay this way, before I bought the pug mill. Exhausting. Stain. A ceramic colorant, formulated from metal oxides and minerals, fired and ground fine to be stable in glazes, slips or clay bodies. Major manufacturers include Mason and Cerdec-Degussa. Refractory. Resisting melting. Alumina hydrate, a component of clay, is an example. In glazes, chrome oxide is very refractory, and will need extra fluxes to compensate. Gerstley Borate. A naturally occurring mineral containing calcium and borate fluxes, also some silica. Used to be a common glaze material until the manufacturers announced that the mine had run out, at which point every potter in the world bought out their local suppliers to stockpile for the coming apocalypse. At which point they announced that they'd found a five-year supply in a warehouse somewhere and surprise! it wasn't going away anytime soon. Half a dozen synthetic versions are now available along with the real thing. My base glaze used to call for 10%, but I re-calculated it using a frit instead. I still use Gerstley in overgrazes because, at a teaspoon a batch, that 150 lbs. is gonna last me well into the next millennium. Frit. Synthetic ceramic material. Generally colorless and used to replace things like Gerstley Borate or water-soluble fluxes. Made like stains, by mixing, firing and grinding. Different frits are known by manufacturer and number. Ferro 3195 is my choice for my base glaze. Overglaze and underglaze. Decorative pigments mixed with glass-forming minerals, sometimes clay or a binding material. Some go on the pot and are covered with a clear glaze. 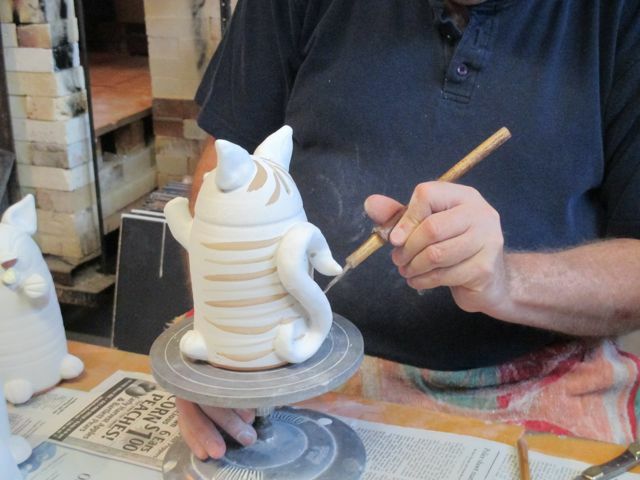 Some go on top of the glaze and fuse into the surface in firing. Guess which is which. Temmoku, celadon. Stoneware glazes, originally from Asia, using iron oxide as a colorant. Celadons are about 2% iron and can be jade green, blue green or olive. Temmoku has about 10% iron, and is generally glossy black when thick, rust red when thin. There are variants with different visual effects, oil-spot, hare's fur. I don't mess with them because I can't paint on them. Cobalt. Ceramic colorant, usually in carbonate form. Unfired, it's lavender colored and I use it straight as an overglaze. Fired, it's blue. It's one of the constants of the universe: death, taxes, and cobalt blue. Except on rare occasions, where it makes lavender crystals. We don't talk about that. Raw glazing, single firing. Most people who learn pottery in school fire pots twice. The first, bisque firing is to an intermediate temperature, usually around cone 06, that fixes the clay while leaving it porous. Pots are sturdier and easier to handle, and can be dipped in glaze without risk of them dissolving back into clay. After glazing, they're fired to a higher temperature, cone 10 in my case, which vitrifies (makes glassy) the clay and glazes. With a little care, however, you can dispense with the bisque firing. Glazes can be applied to raw (unfired) pots, either in the leather-hard or bone dry state. In the former case, you'll need to reformulate the glaze with more clay in it, so it shrinks with the pot as it dries. 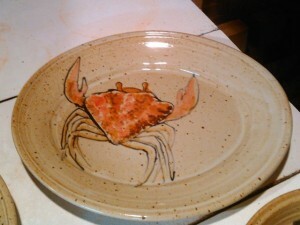 With bone-dry pots, you can use the same glazes as with bisque. You'll warm up the glaze kiln a little slower when single-firing, but in some situations--wood-firing, for instance--you'd do that anyway. 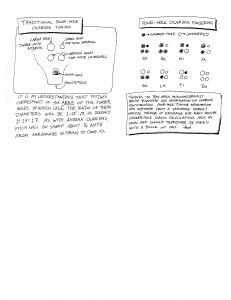 I used to be a dedicated practitioner of single-firing, from Tuscarora right through graduate school. Working in a crowded Craft Center changed my mind, and now that I have to transport pots from my home studio to the cooperative where I glaze fire, I absolutely bisque fire again. Rib. 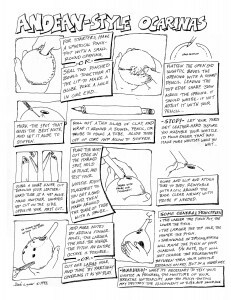 A stiff or flexible tool whose edge is used to shape, compress or smooth the clay. I suspect the original ones were flat pieces of beef rib bone. Now they come in wood, metal, rubber and silicone, in an almost unimaginable variety of shapes. Kick wheel. An acoustic (i.e. not electric) potter's wheel. Basically a frame holding a heavy flywheel at the bottom connected by shaft to the wheel head at the top. Most flywheels are cast concrete, though the Tuscarora pottery school had some with a three-foot disk of plate steel that would spin nigh on forever. We used to kick up the wheel then go have coffee and a muffin on the front porch; when we came back into the studio they'd still be spinning. With European style kick wheels like the Lockerbie or my homebrew first machine, you kick your feet directly against the flywheel. Treadle wheels like the Leach wheel have a wooden kick bar whose back-and-forth motion is converted to rotary motion by a a crank built into the drive shaft. I never liked Leach wheels much; the point where the treadle changed directions always introduced a little bump into the pot that I never managed to erase. Bat. Either a) a wooden, plastic or plaster disk that attaches to a wheel head to make it possible to remove wide or fragile pots safely from the wheel while wet or b) a plaster slab or tub for drying out slip for recycling into clay. Etymology unknown, and it never made sense to me that the same term is used for two such different objects. Giffin grip. An expensive, over-designed device that clamps onto the wheel head and re-centers and holds pots in place for trimming. Real potters don't need crutches like this, preferring to tap their pots on center and hold them in place with clay wads. (/sarcasm) I actually own two of them, though to be fair, I won the second one as a prize for Best in Show at Clay Fest. I did finally learn how to tap pots on center, and feel vaguely guilty using the Giffin, but it's so fast and easy, and besides, I bought it in 1984 and it's still trimming pots, so the price is now tenths of a cent per pot and still amortizing. Pulling handles. Forming handles from a pre-shaped piece of clay either attached to the pot or held in one hand. 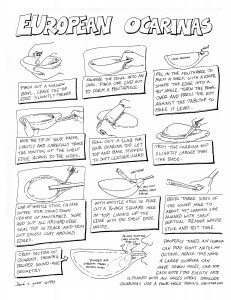 Dip hand in water, then stroke downward on handle with thumb and forefinger. Gentle pressure is the key, or you'll pinch through the clay have to start over. Motion is not unlike milking a cow by hand. Slip. Clay liquefied to the consistency of pudding. You can make some by dissolving dry clay into water and mixing; it also happens naturally while throwing pots as you add water and pressure to the clay. I fill a little container with slip scraped off my hands onto the edge of my throwing bucket. This is the perfect ceramic glue; it's sticky, it dries fast, and leaves only clay behind. Score and slip. 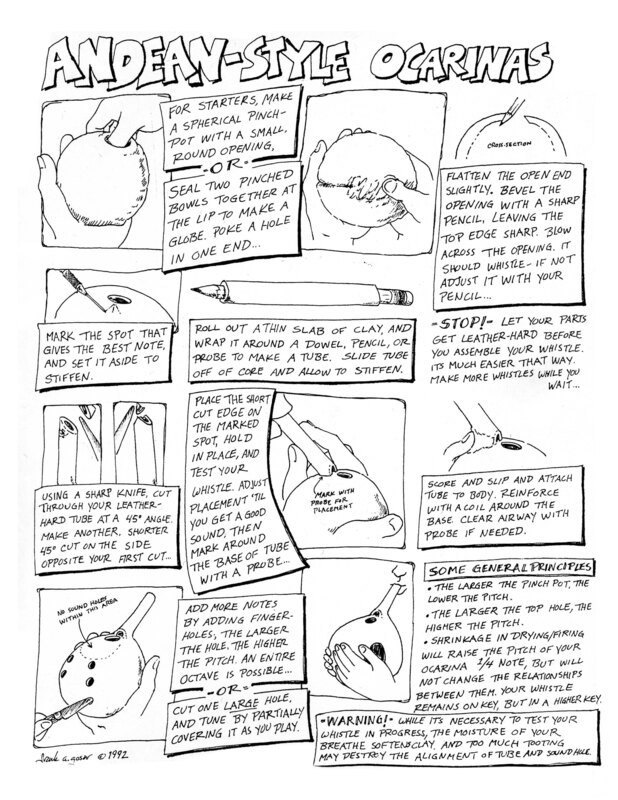 Scratching the surface of a leather-hard pot with a needle or serrated rib and working some slip into the spot. Used to help attachments like handles stay on. Leather-hard. Stupidest term in the ceramic lexicon. It's a stage midway between wet/sticky and bone dry. Further qualified by "soft" or "hard" leather-hard. It really means your clay is the consistency of a Hershey bar. You can cut it with a sharp tool, maybe deform it a little, paddle it, but it's not sticky, and it holds its shape when you handle it. This is when to trim a foot, attach a handle, carve a pattern, smooth off fingerprints. Trimming. Also called turning. 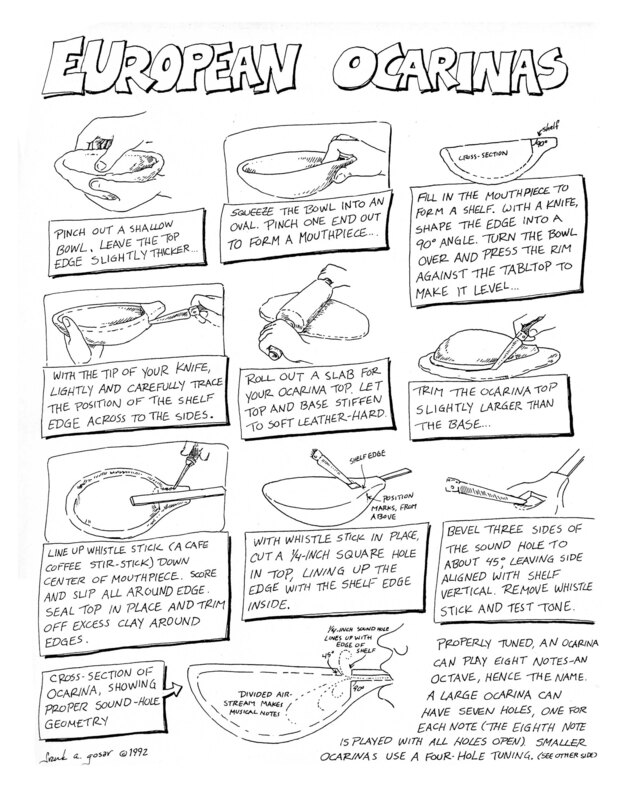 Flipping your pot over and centering it on the wheel, holding it in place with clay wads (or a Giffin grip), then cutting away clay with a sharp tool with the wheel turning, to form a raised, ring-shaped foot.